A family run yoga studio located at 230 College Street in downtown Burlington, Vermont. 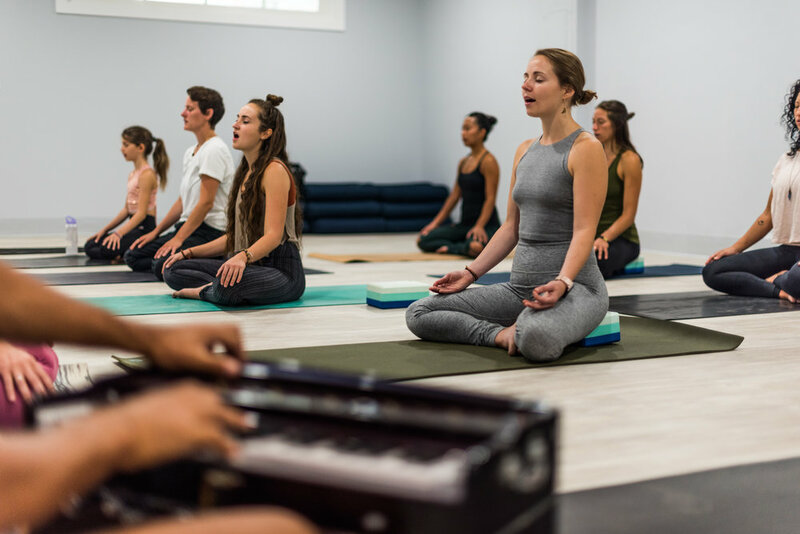 Sukha Yoga offers Bhakti, Hatha, Vinyasa, Meditation, Yin, Restorative, Yoga Nidra, Mantra, Kirtan, continuing education and Teacher Trainings. We combine the ancient Tantric techniques of traditional Hatha Yoga and the philosophy and lifestyle of Bhakti. At Sukha we believe strongly in delivering the authentic teachings of Yoga as they were meant to be taught by the rishis of India. Although our vinyasa classes will challenge you physically, we want people to take away the message of unconditional love, unity and connection. We embrace the philosophy and lifestyle, incorporating it into our modern way of living, and strive to do the same for those in our community. Through consistent practice of the yogic techniques, study of the ancient literature, satsang, good association and devotion to help others, we can begin to discover our true nature. We are all in this together, and if we strive to achieve the best version of ourselves through our practice, we are able to spread that kindness and light to others. Noah and Cilla Weisman opened the studio to share their passion with others, continue to grow and connect, and have the opportunity to give back. They teach in honor of their teachers with tremendous gratitude to serve. Sukha is a Sanskrit word meaning “good space”, happiness, bliss and ease. Our mission at Sukha Yoga is to create this space for self discovery and positive transformation so that we can become more connected. When our awareness is heightened through self-discovery, we are able to see past our own needs/thoughts/desires/self and offer ways in which we can uplift humanity as a whole. Since the soul is eternal, there is nothing material that can bring us true happiness, and the sooner we can realize this, the faster we can accelerate on our spiritual path. The conscious effort to use our discernment and give selflessly will lead us to authentic happiness, freedom and unity. Cilla Weisman E- RYT1000, co-founder and instructor at Sukha Yoga in Burlington Vermont, is a lifelong student of the mind, body, and soul. She began a daily practice in 2001, and has been teaching yoga for over 10 years. She believes strongly that as teachers and leaders in the community, we should have our own sadhana (daily practice) and continually learn from our teachers so we can continue serve others. Cilla began her higher education with a Psychology degree from the University of Vermont. At this time she was uncertain of her path, but knew that she wanted to help others. She was drawn more to Eastern philosophy and holistic medicine, so instead of continuing toward a Master’s Degree in Psychology, she decided to attend Touchstone Healing Arts for an education in Massage and Body Work. This school provided an in depth training in anatomy, structural alignment, body mechanics, spirituality, and holistic health. Over the years as a practicing Massage Therapist, she had the opportunity to work with countless individuals. She received certifications in Thai and Balinese Massage, Lymphatic drainage massage, Hot stone, Cupping, and Ayurvedic treatments. She completed her 200 hour teacher training locally (Burlington, VT) and spent several years teaching classes and assisting with 200 hour teacher trainings. She completed her first 500 hour Advanced training of Hatha Yoga under the Tantric Tradition in Bali, Indonesia. Here, she was able to refine her sequences, class structure and techniques, but more importantly, dive deeper into her own subtle practice. As much as she loved the Tantric techniques, it felt as though she was missing a deeper connection. They say when the student is ready, the teacher appears, and at a time of great need, Raghunath appeared in Cilla’s life and changed it’s course forever by giving her the gift of Bhakti Yoga. This tradition helped connect many of the missing links she had been searching for and also introduced her to a community of higher thinking, simple living, devotion and love. Through mantra, satsang, study of sacred literature, kirtan, association, Seva (selfless service) and devotion, we can completely change the way that we think, act and love. She completed Raghu’s 500 hour Advanced YTT Cultural Immersion of Bhakti in India, where she was able to learn and explore the culture, ancient scriptures, music, and philosophy as well as discover a stronger connection to the divine. In addition, she is honored to have had the opportunity to sit with and learn from Raghu’s teacher, Radhanath Swami. Cilla is grateful for all of her teachers and forever indebted to them for changing her life. She tries to repay this debt by giving all that she has to her students, and by offering Seva in the community. She keeps her classes and teachings authentic by offering Bhakti with the hopes of inspiring others on their path and serving as a vessel to deliver positive transformation. Always a student, Cilla has received continuing education and Certifications in Yoga Nidra, Yin Yoga, Aerial Yoga, Yoga Tune Up (self massage and therapy ball work) and Stand Up Paddle Board Yoga. She has over 60 hours of continuing education in anatomy, alignment, skillful assists and handstand preparation and practice. She’s completed an 200 hour Ayurvedic Integration Certification course at The Ayurvedic Center of Vermont and certified in Marma Therapy. She offers 200 and 300 hour teacher trainings and continuing education courses at Sukha Yoga, and assists her teacher, Raghunath, in his 300 hour trainings in India and SuperSoul Farm. Teaching schedule: Monday: 9am Yin , Tuesday: 9am Hatha, 6-7:15pm Flow, Wednesday: 9am Hatha and 10:15 Yin Thursday: 9am Hatha Friday: 9am Yin, 12:15 Core flow, and 6pm Vinyasa, Saturday 9-10:30am Complete Practice, Sundays workshops, trainings and events. Noah Weisman, co-founder and RYT500, grew up in Burlington, VT. He began his study of the body and movement in 2003 when he started training in Brazilian Jiu Jitsu. He trained under Carlson Gracie Sr, protege, Julio Fernandez, one of the original Carlson Gracie Sr black belts. Jiu Jitsu translates as the “gentle art” and focuses on using your opponent’s force against themselves rather than opposing their energy. Noah took his BJJ to the next level by receiving his brown belt and competing as a professional mixed martial arts fighter for several years. He fought both locally and on the national level. He loved that he was able to condition and push his body to new places, while also remaining calm and focused. He also enjoyed sharing his love of the sport and of physical fitness by teaching various mixed martial arts and conditioning classes. When Noah met Cilla a decade ago, he was training several hours a day around the same time she began teaching yoga. It took several years of her teaching, with some gentle coaxing, before Noah finally decided to give yoga a try. Initially, he would go to her core yoga class hoping to work a sweat and build more strength for his MMA/BJJ practice, but what he found with consistent practice was much more than just physical strength and endurance. He liked the physical challenge of the asanas themselves but found amazing mental benefits from the more subtle aspects of the practice. He continues to practice daily and is always looking to deepen his yoga practice through books on philosophy, workshops and self study. Noah was born to teach and connect with others and his passion for life is inspiring. He feels that we can all make small improvements every day and over time this will lead to an improved quality of life, not only for ourselves but for those around us. Schedule: Monday 12:15-1:15 Flow & 6pm Vigorous Vinyasa, Tuesday 10:30am Chair Yoga, Thursday 6-7:30pm Vigorous Vinyasa, **Tuesday & Wednesday 12:15 classes coming in the spring. Monthly Kirtan, Assists Teacher Trainings. Lauren Goldstein is a Vermont native who has a strong passion for yoga. She discovered yoga in high school and has practiced ever since. She began teaching Vinyasa in 2013 and enjoys offering the more subtle yet powerful practices of Restorative, Yin, Yoga Nidra, and guided Meditation. Lauren is also a certified Reiki Practitioner. As a teacher she combines alignment focused sequences with breath work to create a balanced a joyful practice. With tapas (determination) and sanatosha (contentment) any person can experience focus within the body to overcome the obstacle of the mind. Lauren's goal is to create this positive transformation, whether it be through strong flows and deep backbends, or sweet restorative meditations. Jintina Sundarabhaya (RYT-200) is a Burlington native and a lifelong student of healing arts. Jintina is a Certified Massage Therapist and has been a professional therapeutic bodyworker since 2005. She has traveled to Asia studying various forms of Eastern bodywork. She has a local practice in Burlington specializing in therapeutic bodywork, Thai Massage and Massage Cupping. Along with this profession she has a deep desire to assist in improving the quality of life for others. Her yoga practice began, like many, with the attraction to the physical benefits -strength, flexibility and balance. Initially she began her 200-hour teacher training at Yoga Vermont to compliment her work as a bodyworker and expand her yoga practice. Once in the training she discovered the world and lifestyle of yoga, which has truly changed her life. Always thirsty for knowledge and as a student for life Jintina continues to deepen her study in yoga. Since completing her 200-hour she trained in Yin Yoga, practiced under amazing yogis from around the country and is currently in another 200-hour teacher training with Cilla at Sukha Yoga. She believes there is always something new to learn and is eager to share her knowledge and experience with her students. Nalini Flanders (RYT 200) was drawn to the practice of yoga as a therapeutic way of honoring the body and quieting the mind. Proper alignment, steady breath work and the grounded nature of yoga has propelled her teachings and allows for her students to experience depth and inspiration on an off the mat. Nalini is a natural teacher who focuses on living gently and noticing beauty and divinity in each moment. In 2012, Nalini spent the fall at the Sivanada Ashram in Grass Valley, California, where she completed her first 200 hour Yoga Teacher Training and volunteered to support the community. After this, she completed an additional teacher training in Vinyasa and Restorative Yoga. She currently works as a Family Wellness Coach at the University of Vermont under Child Psychiatry. She also teaches Yoga and Meditation for the Wellness Environment. She loves to guide others in an exploration of the connectedness between mental health and yogic practices. Nalini’s classes are a blend of Vinyasa and Hatha, allowing for each practice to evolve into something deeper physically, mentally and spiritually. Sukha welcomes local guest teachers as well as teachers from across the US to lead specialized workshops, trainings and events. We are proud to invite these guest teachers as a fun way to get the community together to grow and learn, all while welcoming new teachers to Vermont. Sukha is a Certified Yoga Alliance school and is very excited to offer 200 and 300 hour teacher trainings. The studio space is large, beautiful and welcoming. We offer different styles so that people of all abilities are able to enjoy the practice. Private sessions and private events are available upon request.